Mal Shaffer passed away on Friday, January 25, 2019, at home surrounded by his loving family. His family will gather with friends on Wednesday, January 30, from 5-7 p.m. at Carlson Colonial Funeral Home. 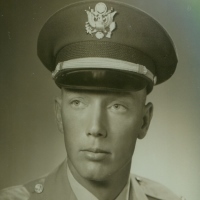 Interment with full military honors will be held on Thursday, January 31, at 10:00 a.m. at the Kansas Veterans Cemetery in Ft. Riley, 5181 Wildcat Creek Road, Manhattan, Kansas 66503. A memorial service will follow at 3:00 p.m. at the First Presbyterian Church, 400 W. Central, El Dorado. Mal’s life began on May 20, 1934, in Brown County, Texas, the son of Bayard A. and Nadine (Sherrod) Shaffer. He graduated from Abilene (Texas) High School, BBA from Hardin Simmons University, and MA from the University of Kansas. Additional education: US Army Infantry School, US Army Command and General Staff College, North Atlantic Treaty Organization Defense College, and U. S. Army Materiel Command School. Assignments: Infantry Company Executive Officer, Ft. Riley, Kansas; Infantry Company Commander, South Korea; Supply Officer, Ft. Benning, Georgia; Assistant Professor of Military Science, University of Hawaii; Senior Advisor, Military Assistance Command, Vietnam; Commander, 5th Training Battalion, Ft. Leonard Wood, Missouri; Chief, Territorial Forces Division, Military Assistance Command, Vietnam; Project Officer, Combined Arms Combat Development Activity, Ft. Leavenworth, Kansas; Chief, Advertising and Public Affairs, Ft. Riley, Kansas; Coordinator, European Headquarters Reorganization, Supreme Headquarters Allied Powers Europe (SHAPE), Belgium; Director of Personnel and Training, Rock Island Arsenal, IL. He retired as a Colonel in 1986. Awards and honors: Legion of Merit, Bronze Star Medal, Defense Meritorious Service Medal, Meritorious Service Medal, Air Medal, Joint Service Commendation Medal, Army Commendation Medal, National Defense Service Medal, Vietnam Service Medal, Army Service Ribbon, Overseas Service Ribbon, Vietnam Campaign Medal, Vietnam Cross of Galantry, Vietnam Staff Service Medal, Combat Infantryman Badge, Parachutist Badge, Ranger Tab. After retirement Mal served at Butler Community College as Fine Arts Coordinator and Adjunct Instructor. Volunteer experience included: Celebration of Freedom Committee, El Dorado Community Concert Board, Knife and Fork Club President, Meals on Wheels, First Presbyterian Church Elder and Trustee. His hobbies included gardening, golfing, cooking, reading and he especially loved attending his seven granddaughters’ musical, theatrical, artistic, and athletic events. Mal is survived by his wife, Janice, whom he married 57 years ago on November 4, 1962. Mal is survived by his daughter, Cynthia (Stan) Shelden of Wichita; his son, Doug (Sonja) Shaffer, of Kansas City, Missouri; granddaughters Rachel (Andrew) Spare, Amy Shelden, Stephanie Shelden, Jane Shelden, Susan Shelden all of Wichita, Isobel Shaffer and Eliza Shaffer, of Kansas City, Missouri.